So you want to buy an original Trimphone? This guide is about how to get a good working model. We usually recommend eBay as the best place to get a bargain. However, great care is needed to make sure you get a genuine original phone, rather than a modern reproduction, or a phone made up from a selection of new and old parts. (*)Fading can make the colours look different. The white/grey phone usually appears ivory with a light beige handset. 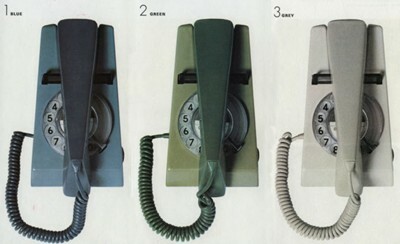 Trimphones in any other combination of colours are not genuine. There may have been a few one-off trials of phones in different colours, but these are exceptionally rare. Since new Trimphones were launched a few years ago opportunities for customising older phones have presented themselves, so check the colour combinations very carefully before buying. Letters and numbers on the base are a very good guide to the age and model of the phone and can help greatly in determining if the phone is genuine. is stamped on the base of a white/grey Trimphone. 1/722L is the model number and L means it has a lettered dial. TCH means STC in Larne, Northern Ireland and 69 means 1969. Sometimes the month is given as well as a number. I have seen TCE (STC in Enniskillen, Northern Ireland), TCH (STC in Larne, Northern Ireland), GEN (GEC in Newton Aycliffe, County Durham), SPK (Plessey in Speke, Liverpool) stamped on Trimphones. There may be others. Read our guide to Trimphone models to get an idea of what model numbers to expect. Phoenixphones (Snowdon Collection) were refurbished telephones. They therefore carried a special type of model number. You should find TELE 8776 or TELE 8722 together with BATCH SAMPLED FWR 82. FW refers to BT's own factory GPO in Cwmcarn, Wales. 'R' stands for 'refurbished'. All Snowdon Collection phones were made up from parts from older phones. This label is a black sticker with white writing. It can be removed, probably revealing an older label referring to the original phone. So you can see Snowdon phones with older dates. This may lead to some collectors thinking they have an old phone in an unusual colour. Most dial Trimphones had a clear plastic dial fingerplate. There are very few with a lettered dial. Most had just numbers. Look for phones in good condition. Avoid heavily faded examples. You can usually tell if a Trimphone has faded badly because the part of the phone hidden by the handset will appear to be a different shade. Most have been rewired for modern use, but you can usually get a bargain if a phone has not been rewired and is in good cosmetic condition. There are a number of reproduction Trimphones on the market made by 'Wild and Wolf' and by Steepletone. The seller should make it clear that the phone is a reproduction, but if not, look out for unusual colours. Wild and Wolf phones have push button dials, but arranged in a ring, like a dial phone. Steepletone phones have a standard type dial. If you want to buy a reproduction Trimphone, the 'Wild and Wolf' Trimphones are pretty good copies of the original. Steepletone Trimphones, in my opinion, are less so. Based on a review of sold prices on eBay this is our assessment of Trimphone prices. You should not need to pay more than £30 for a standard Trimphone in good cosmetic condition and in working order. Snowdon collection phones are worth more. Rare models such as the 712 Trimphone and Trimphones with lettered dials will be worth more. I have 2 trimphones with the base and handset clad in leather - one in black and the other in red.Both work fine. both have 2 labels. black -TELE.SR.1016A STC80/1 OVERSTICKERED WITH SR8016 A FW8/82 BRITISH TELECOM SUPPLIED. "We have an original trim phone which we�d like to get converted/updated (lack of a hashtag makes phoning large companies difficult) - can you help? You can't fit a # key on an old Trimphone. You could either go for one of the reproductions, Wild and Wolf or Steepletone, which will have the # key or buy an original push button one from the 1980s. Many years ago we tried using an old button trimphone. We found it unreliable. I think the circuitry was quite advanced at the time. Using one 30+ years later is probably not going to work on a day to day basis. So I'd probably get a reproduction one.